This is the most hilarious error ever! Where did you get that? Was it a computer you were setting up? Yes it was the first boot of the machine... the machine is fine but this is one of the funniest errors I have seen. Kind of like the BSOD when they debuted XP wasn't it? Thanks for the explanation under the picture...I was struggling.. You must know that people as computer challenged as me read your blog. I have NOT missed those "oh-so-annoying, stop-you-in-your-tracks, wrath-provoking, guess-I-better-reboot-again, as-though-I-have-nothing-better-to-do" error messages. I still heart my new IMac. 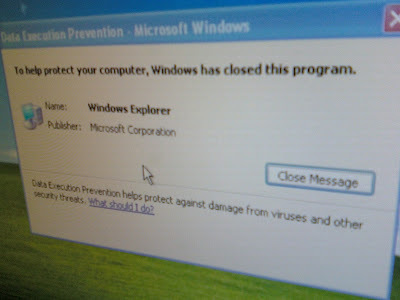 What I would like to see is Windows XP SP3 classified as a virus after I installed it once, got the black screen of death, uninstalled it, reinstalled and ended up with a corrupted system file and many hours of reinstalling Windows. Microsoft truly is the Evil Empire.